Before building a product - how do you know what product to build? While building a product - how do you know what features are the most valuable? After you've built a product - how do you know if to tune stuff or add a new one? What does it mean to discover a product? Product delivery is what we do, right? It's when you have a scope, some requirements and you build a product to satisfy them. But how do requirements appear? If this sounds familiar to you then don't worry - you're like most companies. But best companies work differently. Best product teams have a Product Discovery process. a process to define a product that is valuable, usable and feasible. Product Discovery answers the question: what product to build? It's a set of practices to quickly validate product ideas and make sure resources would not be wasted. Is there one way to discover products? No. There are multiple ways. Those you can call discovery methods, but how about the process? How to start to discover products? Get familiar with the concept of dual-track development. Split your product backlog into a discovery backlog and a delivery backlog. Submitting ideas should be easy and entire company should be encouraged to do that. You never know from where the next great product idea would come. So you need to listen. Create an idea backlog. Where everyone within a company (and maybe from outside as well) can insert their product ideas. Product Discovery process requires time and effort. You don't want to waste that effort. Filter ideas before putting them to a discovery backlog. You need a simple filter for that. Does this idea support your product strategy? What objectives or KPIs could be affected by this idea and how significantly? You don't need to provide hard evidence when answering these questions. At this stage use your expertise to quickly differentiate good ideas from the bad. Go through your discovery backlog and together with your UX and research colleagues select an appropriate method for assessing each idea. Estimate roughly the effort needed to execute the research. Now when you know the estimated effort needed to validate each idea in the discovery backlog you need to decide which ideas to validate first. Ideally, you would validate the most potentially valuable ideas first. You can also prioritize based on the possible impact or the biggest risk. Your entire team should participate in the Discovery Process. It increases the shared understanding of user problems, your market and challenges you need to overcome. It also builds a rapport within your team and with the outside world. Ideas that been validated and look promising should be moved to a delivery backlog. Ideas that you don't have enough confidence about could be either further researched or dropped. Stop being like most companies and just deliver not valuable and barely usable products. Discover the right product before delivery and keep on discovering while you deliver. Try those 7 steps and you'll see the increase in the quality of your delivery backlog and therefore your product. 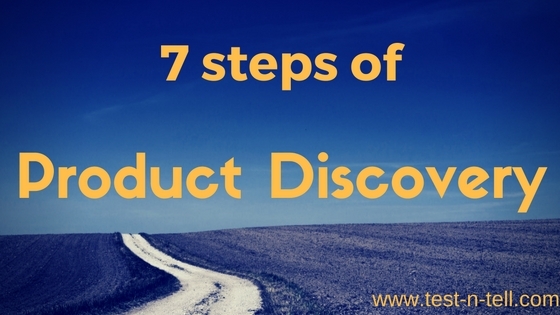 In further articles, we'd dig deeper into Product Discovery.